But always, always, when we take few moments to look deep inside our soul, listen to our heart, trust our inner self and strength, our mind we'll find a way to help us made it to the surface! 7 stages of grief - Read about the seven stages of grief (shock, denial, bargaining, guilt, anger, depression, hope) and learn to cope with the death of a loved one dealing with the grieving process. Words can deeply touch and penetrate the deepest part of our hearts and souls, when spoken with honesty and passion directly from the heart. 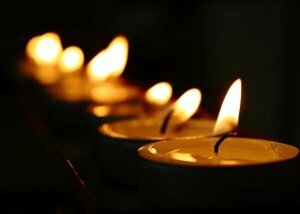 When words are used to comfort someone who's grieving, it helps them feel that they are not alone, are loved and have a shoulder to comfort on, so, words can bring a drop of tranquility, hope and enlightenment. But sometimes, words, may not be enough to help empower the mind of a grieving person, and I deem that for a grieving person to heal and recover, she/ he or she needs a lot of of space and healing time alone in order to be able to fully accept the loss and go through the whole process of healing and recovery, to be able to pray and meditate, to think and reflect on life as a whole will definitely help. Was desperately craving for a simple, quick and easy vegetarian recipe, savory and delicious... and discovered this simple, quick and easy recipe for peperonata Italian vegetarian recipe that I'd like to share it with you, too, to feel the suave flavor of fresh veggies. So, if you feel also in a mood to try a quick delicious Mediterranean recipe, then peperonata (or peperonatta), the Italian vegetarian recipe is the best choice, flavored, tasty and mouth-watering, just perfect for a 15 minutes dinner recipe! And peperonata's main ingredient - as it's name says itself - is the colorful juicy fresh bell pepper - red, yellow, green pepper color! Peperonatta recipe is so versatile - bell peppers can be cooked in many ways - fried in basic way with garlic and onions; or adding more ingredients, according to taste (potatoes, tomatoes, etc), then served as it is, on a lightly grilled slice of bread or as side dish pork, beef, chicken or fish. Also, peperonatta can be prepared frying the ingredients for a long time or a short time till it gets like a stew or just a little time, enough to keep vegetables crunchy and tasty. With this delicacy on the table your meal gets taste, color and savory, and you'll find yourself asking for more and more peperonatta! – if served as side dish along with pork, beef, chicken or fish, fried or boiled potatoes, olives, topped with mozzarella. Peperonata is an appetizing Italian food made from fresh bell peppers served mostly in summer, but also perfect to be prepared in any other moment of the year. This simple, quick and easy Italian vegetarian recipe is healthy, savory and with a pleasant colorful aspect. Peperonata can be cooked using a single color bell peppers, if you prefer, but for a more colorful and appetizing effect I rather put all 3 colors – red, yellow and green bell peppers – found on the market. • Preparation time: 10 min. • Total time: 45 min. Peperonata is a traditional Italian recipe and one of the most easiest recipes to make, it requires just few steps, and in a blink of the eye it's ready to serve! - Do not pour water - bell peppers are juicy enough - just be careful to stir frequently till they get soft and tender. Depending on my culinary taste for the day, I like to serve peperonata as it is and with fresh corn polenta, toasted polenta or fresh crispy slices of bread. - always use fresh ingredients and healthy bell peppers, tomatoes and onions - sweet and ripe - to get a savory food. And preferably not canned ones! Enjoy this Mediterranean recipe, a traditional Italian peperonata! 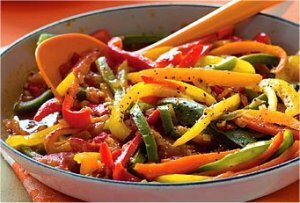 - If you're cooking peperonata in springtime, it will be even more delicious to add few green onions - the food will get a more colorful aspect and a rich flavored taste. - If you're adding a drop of chilli pepper, the food will get a bit spicy and taste even better. - I also like it with a very fine pinch of cinnamon pour at the end - hmmm, this gives such an amazing flavor! This wonderful veggie comes in a wide range of colors: red, orange, yellow, green, and even purple, brown or black. They are crunchy, juicy, beautiful and flavored, but not hot. We can find bell peppers on the market all year round, but their season is in summer and beginning of autumn. Bell peppers is beneficial for our health cause they contain: vitamin A, B2, B3, B6, C, E and K, folate, magnesium and phosphorus, potassium, and it is said that they prevent arthritis and asthma as well as gastric, esophageal and prostate cancer. 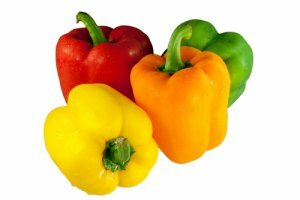 They are favored in diets as they are rich in vitamins but very low in calories (20 calories/ 3.5 ounces bell pepper). Rambling on Greek paths, I simply fall in love with spanakotiropita, the traditional Greek pie recipe with spinach and feta cheese! Have you tried this easy and absolutely delicious fie before? Spanakotiropita (known also as Spanakopita) is an authentic Greek pie, very rich, stuffed with spinach, onions, cheeses (usually feta cheese) and herbs that are all enfolded by crispy, flaky phyllo dough. This easy to make Greek spanakopita, made following my Greek pie recipe, is a perfect snack for breakfast as well as any time during the day, for take away or serve it on a plate - is just great as it is or served as aperitif, topped with yogurt, and along with salad, grilled meat or other delicious food. Spanakopita can be served all year round - at Christmas, Thanksgiving Day, Easter, special events, celebrations, parties or any other time you feel like for an appetizing slice of pie. 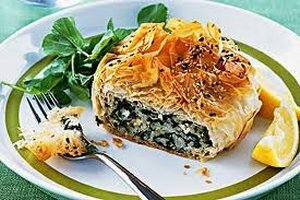 Give a try with this perfect recipe for a delicious traditional Greek spinach and feta cheese pie and... you may become addicted to it and many other yummy international cooking recipes from Mediterranean cuisine! Or if you are a spinach and Middle Eastern cuisine lover, as well, then definitely you'll enjoy my other recipe - Best chickpeas crepe recipe - with spinach! Ingredients are the key for making this traditional Greek spinach and feta pie recipe sooo delicious. You need to use fresh phyllo and do not let it dry out. If you stick to those two "rules", you should have no problem at all. You may use frozen spinach (which could make some purists cringe), and always use the best feta cheese, very good olive oil and freshest herbs. Spanakotiropita is an authentic and very rich Greek pie, stuffed with spinach, onions, cheeses and herbs that are all enfolded by crispy, flaky phyllo dough. Flaky phyllo sheets are layered with a savory spinach and feta cheese filling. 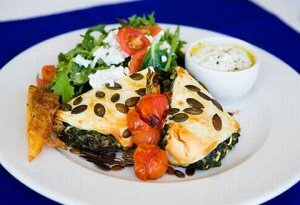 Spanakopita can be made as a "pie", pita or individual phyllo triangles. Spanakotiropita makes a fabulous weekend meal served as aperitif or main course. You can serve it as it is or with yogurt aside and more herbs as you like. Total time: 1 h 30 min. 2. Wash and drain the chopped spinach very well. If using frozen spinach, thaw completely and squeeze out excess water. Spinach should be dry. everything with a fork. Add lightly beaten eggs and combine into mixture. 4. Brush a 9 x 13 pan with olive oil. Lay down a full sheet of phyllo. The edges should come up and over the sides. Brush with olive oil. Lay down another entire sheet and brush with olive oil. Now cut the sheets in half with kitchen sheers so they fit just the bottom of the pan. Continue to layer sheets of phyllo brushed with olive oil until you have 6 sheets. 5. Put spinach and cheese mixture in the pan and spread evenly. Layer with 4 more half sheets that completely cover the spinach. Brush each layer with olive oil. Use full sheets again for the top 2 layers and allow the edges to come up over the top of the pan. Carefully roll the edges that overlap the pan inwards to create a rolled edge of phyllo around the perimeter of the pie. Brush entire top and edges with olive oil. With a sharp knife, make slits in the top of the pie to avoid bubbles when cooking. 6. Preheat oven to 350'F/ 175'C. Lightly oil a 9x13 inch square baking pan. 7. Bake in a 350 degree oven for about 40 minutes or until phyllo pastry is golden brown. Remove and cool for 10 minutes before cutting and serving. Cut into squares and serve while hot. The vibrant greenish spinach is one of the most beneficial edible plants for our consumption. - iron, magnesium and manganese, niacin, phosphorus, selenium and zinc. All in all, eating spinach our entire system will benefit and our general heath will be improved - spinach heaving important effects for our skin, calcification and bones, immunity, brain and nervous function and... is perfect for diet! If you love nature, geology, spectacular landscapes and challenging the unknown in real (not seeing them from the airplane, watching documentaries on TV from your comfortable coach or browsing your friends' photos posted on Facebook :) ), you may enjoy such experience - mud volcano - in Romania and explore it while getting off the beaten tracks, going out and around at your own peace. 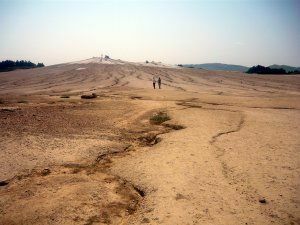 So, one of the most spectacular and unique natural sites in Romania (and Europe) are the Mud Volcanoes - Vulcanii Noroiosi - from Berca, Buzau area - a "piece of world" with an unusual shape, similar to lunar landscapes, that none traveler should miss. 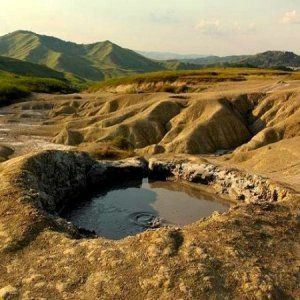 The natural beauty of Romanian Berca Muddy Volcanoes - the Little Mud Volcanoes and The Big Mud Volcanoes - will simply fascinate you. Have you ever seen a Muddy Volcano? The Muddy Volcanoes from Berca and Paclele Mari are a spectacular place and unique natural wonder, with sort of lunar landscape aspect, located in the Buzau mountains, and with less powerful geological reaction (eventually, as one may expect). These spectacular moonscape mud volcanoes from Berca, Buzau county, have the same structure as the real volcanoes, occurring in similar processes, are generated by the eruption of mud, water and natural gases, are not very high (~ 6m), but with important value, being both, a geological and a botanical natural reservation. The entire site here is impressive for the viewer, offering a large palette of “Earth colors”: black, brown, gray and greenish… sienna and chocolate borders on top of craters, white crusts of crystallized salt and stripes of yellow sulphur mud. In Romania, The Muddy Volcanoes from Berca, is an unique reservation. Just backpack and enjoy your trip to feel and sense a mud volcano! 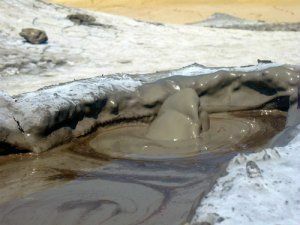 Around Mud Volcanoes usually is hot (especially during summer, when temperature is about 40′C), a permanent bubbling mud that makes the soil very arid and salty. In this desert-like landscape, the vegetation is poor and seldom, so only very few flowers or plants could be seen over this place, the “survivors” being Nitraria schoberi and Obione verrucifera. The absence of vegetation around the cones creates a different aspect around muddy volcanoes, offering to the viewer a lunar alandscape. This phenomenon can be noticed in two separate places nearby Berca – the Little Mud Volcano and The Big Mud Volcano. Volcanoes form no exception to the principles of universal order. They may appear to be physical flaws, and to assume the character of accidents. The devastation which they have produced lead men to regard them very naturally as evils. But two things are certain. They arrive from the operation of natural causes which, however secret, hidden, and difficult of discovery, science may approach with a firm conviction that they are within its domain. And they subserve important and beneficent ends, some of which are already well understood. John Kennedy, Volcanoes: Their History, Phenomena, and Causes (London: Religious Tract Society, 1852), pp. 7-8. - and considering that these are really muddy : )... better take proper shoes (sturdy shoes or tightly fastened sport sandals - in summer) that allows you to walk without suffering, then scrub-down. - volcanic spa mud mask. When buying cosmetic products make sure they contain as much possible natural elements, are non-allergenic, fresh and enough time till they’ll expire, have references from various customers. If you’re taking a day tour in the cosmopolitan British capital, after wandering for hours amongst charming, old cobbled streets in picturesque center, feel the need to unwind a bit after visiting last museum from your list, or need a fun night time, don’t miss to dive for a beer in London pubs and refresh yourself with a genuinely local brew! You can nibble on savories of local food, snacks and cakes, and enjoy a drink in various pubs in London that suit your mood and choice from cozy to chic, quaint or traditional spots, eventually admiring the view and Victorian architecture from a riverside pub. or go find a late-night drink to an elegant pub or a traditional one, off the beaten track or in one part of city that doesn't sleep and have a novel “tourist experience”. - old-fashioned pubs where to sip a craft beer or cider straight from the source low-beamed bar and the 18th century interiors, where you also may have the chance to hear an old legend, listen to a local song and taste some hefty fry-ups ("The Anchor", "Sherlock Holmes", “The Red Lion” known as the oldest pubs in London). 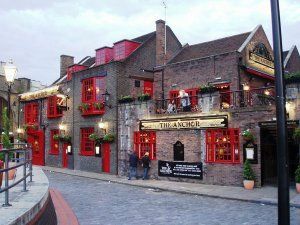 About the most famous, old and attractive British pubs, a special friend of mine from London, said that "One of these is the The Anchor in Bankside, London. As well as reportedly being built on the site of a plague pit, several theatres were situated there during Shakespeare's time. There was also a bear baiting pit in the pub. Our most famous diarist in history is Samuel Pepys, and he watched the Great Fire of London from the Anchor. It escaped then but has been burnt down on other occasions, the last time being 1676." 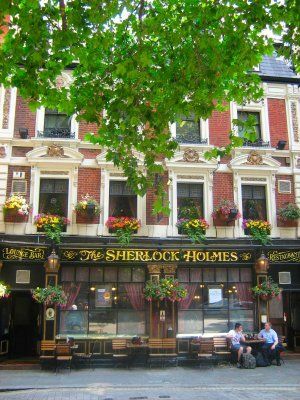 London pubs are perfect to dive for a beer either alone or with a group of friends if you're looking to explore a new place or just visiting the city! So, time for a beer? Cheers! Addicted to Coursera – free online learning! Education anywhere, everywhere for anyone! Hmm, most probably I’m a mid-age nerd that still loves to read, learn and expand my inner horizons. Last year, for example, while talking with a very good pal of mine about my constant desire to improve my knowledge, he told me about COURSERA saying that this is the perfect source for online coursers suitable for various domains of activity, and as it’s FREE! So, I start browsing the net searching for this tempting platform and found it immediately. And I couldn’t believe that was so well done and presented, an attractive layout and very friendly features. It is so easy to browse around for finding your favorite course, read it intro, when it starts and how long it takes till final exam. COURSERA (www.coursera.org/) is based on the support of many famous Universities in the United States (State University of New York, University of Colorado Systems, Berklee College Music, University of Pennsylvania, Stanford University, Johns Hopkins University, University of Copenhagen, American Museum of Natural History, Duke University, etc) and abroad partners (Ludwig-Maximilians-Universität München, University of Melbourne, National Taiwan University, etc), and their excellent team of professors. I was amazed to see here a plethora of courses covering so many fields of activity (business, medicine, art, design, architecture, photography, travel, mathematics, genetics, engineering, law, accounting, etc), and the learning support in English, Spanish, French, German, Italian, Arabian and Chinese. The learning system is very well built, any individual can learn either on his/ her own or joining groups, learning at your own peace or being an active participant in dedicated forums, and at the end you may get a diploma for attending the class! - Volcanic Eruptions: a material science, etc. So, I have already completed 3 courses with Coursera, attending one right now, and subscribed for 2 more, where I’m on waiting list!